The 2200 insert, with its focus on efficiency and elegance, is an excellent example of Osburn's know-how. The bay window adds a touch of elegance to your fireplace and also improves its heat output. The 2200 insert is designed to offer a long burn time in slow combustion mode and can provide comfort for many hours - even overnight - thanks among other things to its ultra-silent standard blower. 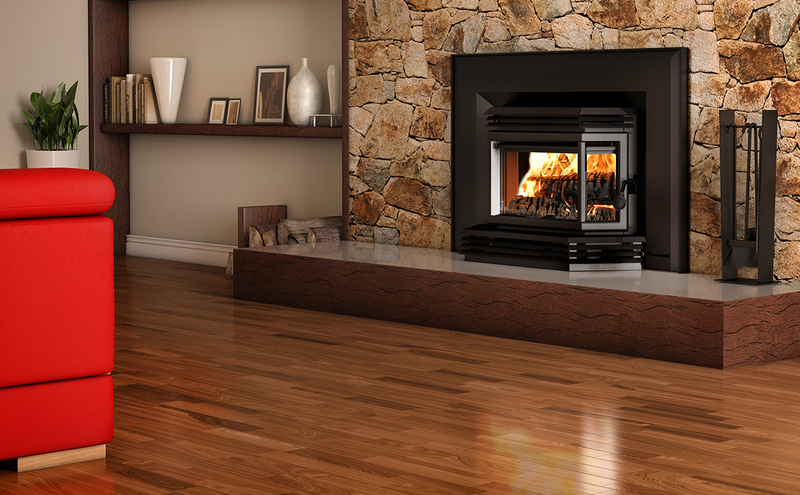 The Osburn 2200 insert - superior features in an eye-catching, high performance wood stove. Fireplace opening – minimum (Height) 22 5/8"
Fireplace opening – minimum (Width) 26 1/4"
Fireplace opening – minimum (Depth) 17 3/8"
Clearance – combustible side mantle to unit 10" 10"
Clearance – combustible side wall to unit 17" 17"
Clearance – minimum floor protection in front of the appliance 22" 22"
Great looking insert! The old fireplace was not very pleasant to look at, and now I love to show it off. It is the centerpiece of the room. I am also willing to use it because I am not throwing money up the chimney. The wood I burn actually heats the house as opposed to sucking warm air out. We bought the 2200i (insert with fan). It is so much better than a fireplace! Our fireplace was probably a net heat _loss_ from our home; the insert adds enough heat that with sub-freezing temperatures outside, our central furnace does not kick in all day. And with a glass door instead of a metal screen, it's nicer to look at and probably safer too. The sliding knob for the damper is easier than reaching awkwardly up into the chimney for the handle. When fan is on high, there is some intermittent vibration which we need to get looked at. The firebox is smaller of course, and some of our existing logs won't fit. - The basic black trim is what I think a fireplace / stove should look like; I don't recommend spending extra on brass or brushed nickel. - Before first fire, read instructions on breaking it in with a few small fires. Extremely happy with the fireplace insert! Turned a useless, poorly designed fireplace into an excellent heat source. The insert has an nice contemporary look. I have been in touch ( via e-mail) with Marc in customer service and he answered all of my questions, was patient and was a factor in purchasing through Osburn. I believe your owner's manual could be more specific in it's explanations and details.